Santa Monica, Calif. (Feb. 11, 2015) — The 57th Annual GRAMMY Awards® on Sunday, Feb. 8, 2015, showcased an amazing collection of musical performances and tributes and utilized the latest in technology to provide television viewers worldwide with a cutting-edge, high-definition/5.1 surround sound event. Caption: Only minutes before the start of the 57th Annual GRAMMY Awards, several members of the 2015 audio team gathered for a photo. Pictured L-R: top row: Andrew “Fletch” Fletcher, FOH System Engineer; Mikael Stewart, FOH Production Mixer; Maureen Droney, Producer & Engineers Wing Managing Director; Ron Reaves, FOH Music Mixer. 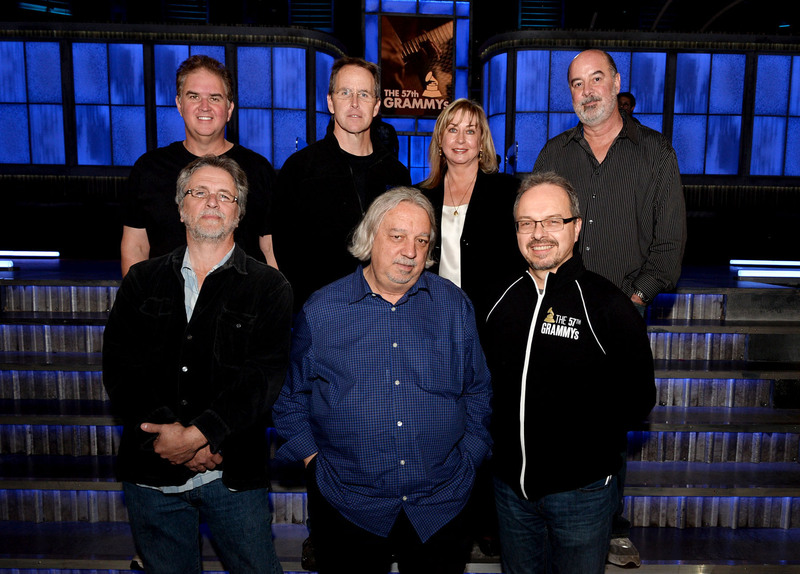 Bottom row: Mark Linnet, M3 Offline Remix Truck Engineer-in-Charge; Eric Schilling, Co-Broadcast Music Mixer; and Glenn Lorbecki, GRAMMY Award Telecast Supervisor of Broadcast Audio. Photograph courtesy of The Recording Academy®/WireImage. © 2015 Photograph by Kevin Winter.